Amandine Nabarra-Piomelli: "My work starts with a photograph and I let the image take me on a journey. I usually decide to work on an idea that is intriguing to me like fantasy worlds - Imaginary Biology - or human experiences - Secret Love, The Caretaker. Sharing mental visions and visual stories requires unusual printing supports. It can be a special paper that I hand-coat with albumen or gesso, a system of thread that allows the image to float, a sonic montage or a sequence that will lead to creating an artist's book. It is an exciting challenge to transform an abstract idea into something palpable that can be shared with others." Irvine, California: Amandine Nabarra-Piomelli, 2017. Edition of 10, second printing. 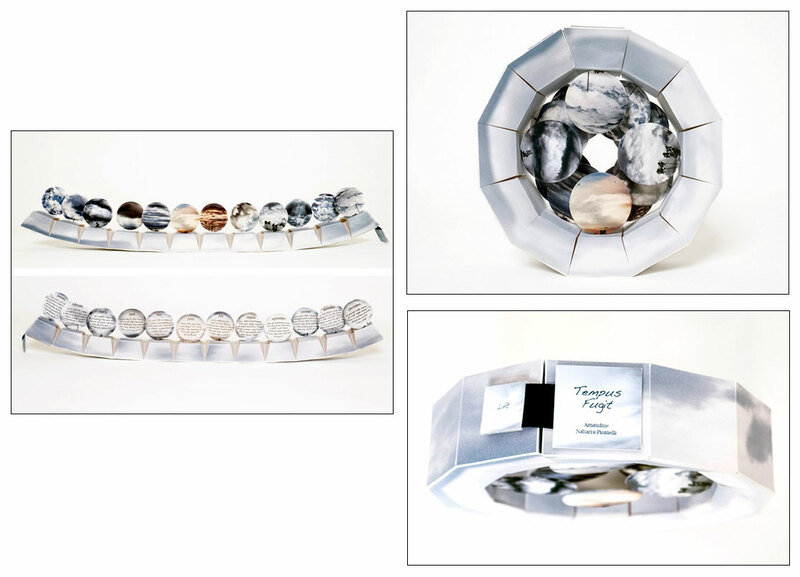 8" diameter circular flexagon binding with magnet closure. 12 circular leaves with 2" diameter. Materials: Vellum, bristol, Mohab, Entrada, brass. Housed in white clamshell box with magnet closure and paper title label on lid. 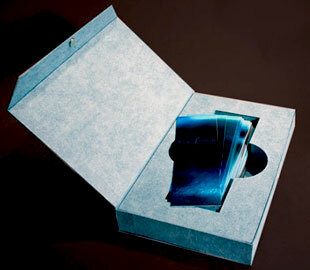 Blue paper wrapper with artist statement and colophon label adhered to interior of box. Flexagon laid inside wrapper. Signed and numbered by the artist on the colophon. Amandine Nabarra-Piomelli: "While watching clouds that were passing over the port of Genoa (Italy) I was inspired to create this artist's book. In the midst of thoughts about nature's forces and movements, tragic events in my life let me take stock of my existence. "The movement of the clouds creates an unpredictable and mysterious energy that colors our thoughts. In this atmospheric energy I found the strength to contemplate my past and imagine my future, I even glanced at my horoscope to counter nostalgia, sadness, and anxiety about my destiny. These coded messages, sometimes prophetic, often funny, became my travel companions." "As clouds and astrological predictions came and went, I found a new equilibrium that enabled me to envision my new life. 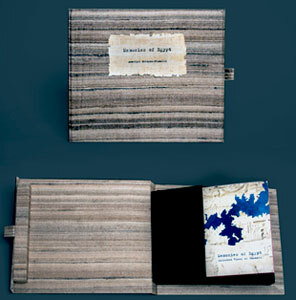 "Structure of the book: An artist's book creates a space to tell a story. To the question 'how to represent clouds?" I constructed a three-dimensional structure that turns and eddies on itself while embodying a visual tale. Like a book, the structure opens to allow a linear reading of the photographs and texts." The pages of the book are images of clouds, one for each month of the year. Each page has a question or statement with a cloud image on the reverse side. June - Does the sun have a strategy? It raises boldly, one morning at a time and gives its all to the day. Irvine, California: Amandine Nabarra-Piomelli, 2013. New Edition of 20. 5 x 6.5" closed; extends to 9". 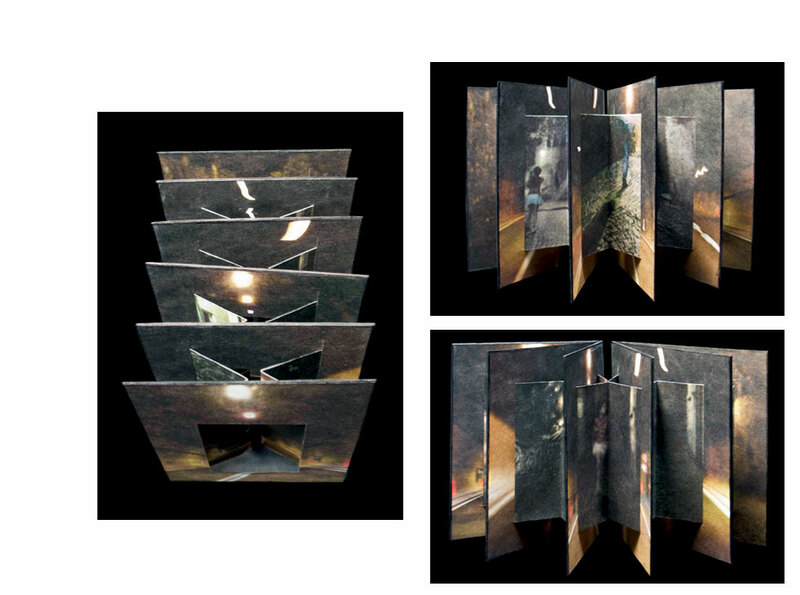 A tunnel book in the form of two parallel accordions supported by 6 frame-like panels. Pigmented digital prints on Japanese mulberry paper. 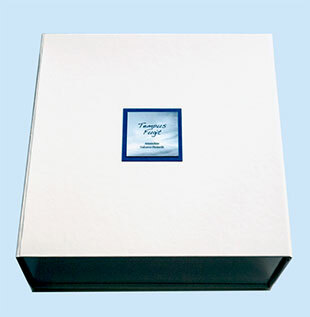 Laid in a custom cavity of a 5 x 6.5" black cloth covered clamshell box. Digital image tipped onto clamshell box exterior. 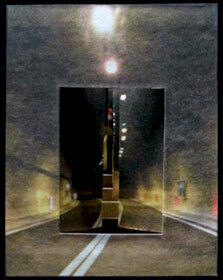 Amandine Nabarra-Piomelli: "The photographs in this tunnel book were shot in Italy and Switzerland. There are tons of tunnels through the mountains. The outside stories were shot in Switzerland and Paris. The inside of the tunnels are in warm tones because it represents a metaphor of how we go through life and eventually it comes together with the man and child holding hands at the end of the tunnel. The outside stories, in cold tones, are about looking for something, someone, searching (for balance, ourselves, etc...), the stressful part of life." Forgotten, Lost and Found was originally produced in 2006 in an edition of 4. This is edition is a re-working of the original. Irvine, California: Amandine Nabarra-Piomelli, 2012. Edition of 4 + 1 AP. 2.5 x 7.75 x 1.75"; 87 leaves. Digital pigment prints on Epson Premium Luster paper. Palm leaf structure. PVC and nylon thread. Housed in Plexiglass box with slide-out lid. Amandine Nabarra-Piomelli: "I have made a big Bernoulli (nearly twice the size) for people to handle. I printed it on transparent plastic strips it looks wonderful and completely different from the paper format. 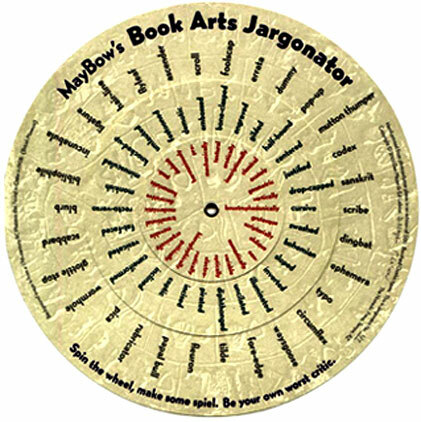 It is looks more like an object than a book when it is larger." 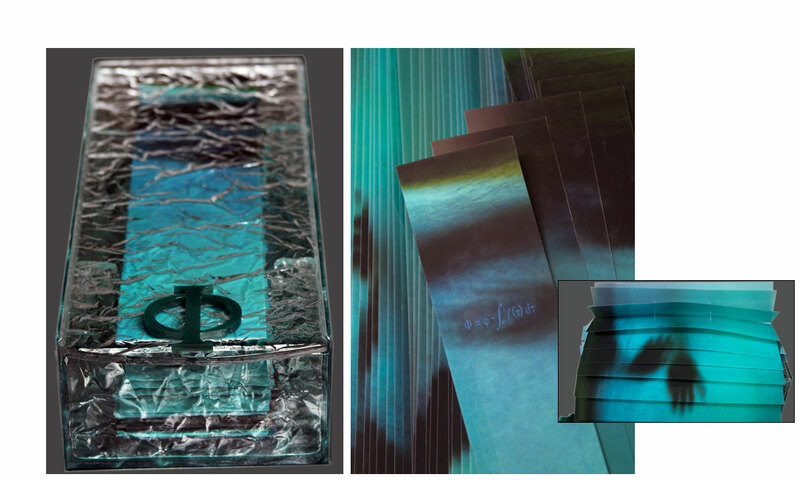 Colophon: "This sequence of nine continuous photographs is a personal representation of the element water. In traditional philosophies it is commonly associated with the qualities of emotions and intuition. Its wavy patterns call to mind waves on the oceans surfaces, described in mathematical theory by Bernoulli's equation for unstated potential flow." Milan, Italy: Amandine Nabarra-Piomelli, 2011. Edition of 100. 6.25 x 8.75" four-fold wrapper with text printed on the interior. 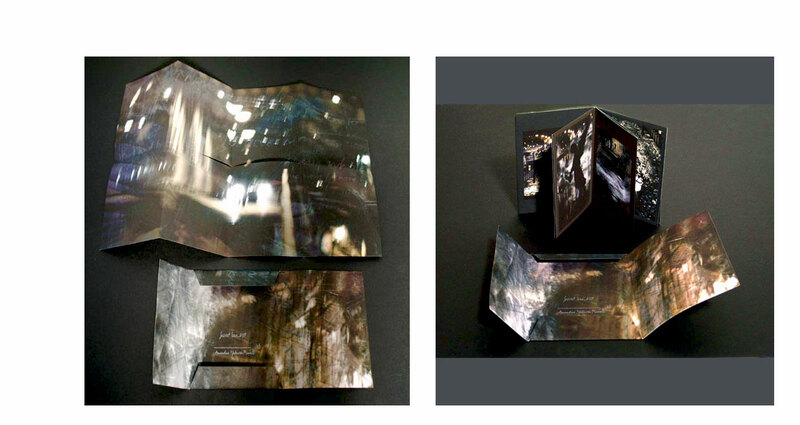 Double-sided 5.9 x 8.25" (extends to 49") accordion book (18 pages) laid in.Offset printed. Text printed in English, French, and Italian. Illustrated wrapper exterior. Band closure with metal ornament. Amandine Nabarra-Piomelli: "A series of 14 photographs taken in Cambodia, Singapore, and Malaysia. 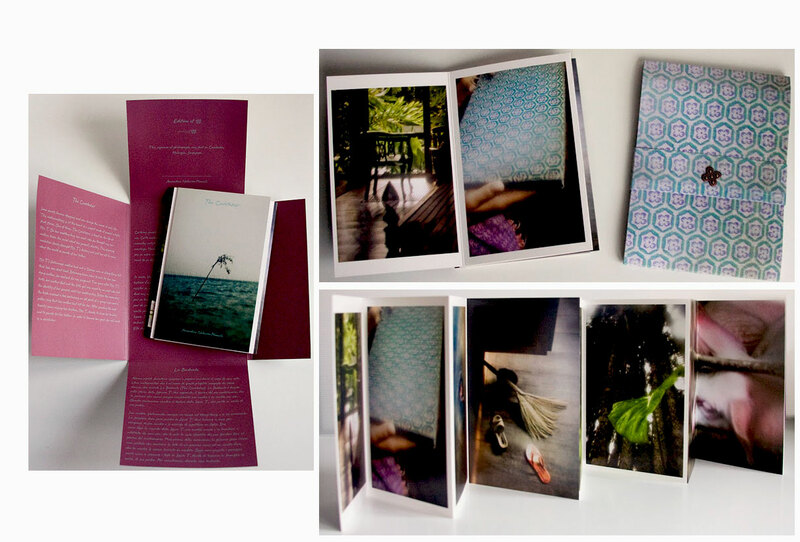 A series of 14 photographs based on a true story and presented as a centered accordion book in a fabric like box. The title of the box is hidden by the band to keep the secret of the story safe." Text: "Some secrets become obsessions and can change the course of one's life. This metamorphosis is at the heart of a project made of several artistic short stories. One of them, The Caretaker, is based on the life of Mrs. T. On her wedding day, her aunt, who she thought was her mother broke the secret about her parents' identity. This shocking revelation slowly changed Mrs. T.'s destiny and sent her off to roam about the world in search of her father. "Mrs. T.'s Vietnamese mother had met a Chinese man in Hong Kong, but their love story was short lived. Returning home to care for her dying mother, she realized she was pregnant. Two years after Mrs. T.'s birth, her mother died and the little girl was raised by her aunt, who hid the identity of her parents until her wedding day. Before the ceremony the bride received a box containing an old photo of a young man and a golden ring that her mother had left for her. After spending the next 20 years raising her children, Mrs. T. decides to leave her family to find her father. In order to finance her quest, she will work as a caretaker." Milan, Italy: Amandine Nabarra-Piomelli, 2011. Edition of 40. 8.6 x 6.75"; 12 pages. Modified double-sided accordion structure. 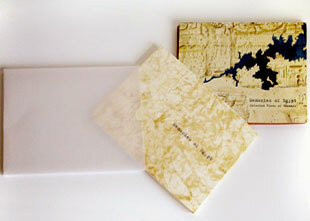 One side has two Italian map folds, each sitting in the valley fold of the main structure. The other side is a more conventional accordion with 6 panels of photographs sitting in the valley fold of the main structure. Printed offset. Both covers treated with a sand texture and embossed. Slipcased: Book slipped into matching full band with printed title, which then fits into an opaque envelope. Boxed: Book in cloth-covered custom box with snap closure and paper title label that contains a smaller hard-sided pop-up holder that book slips into. Colophon: "This book is made of two maps, Northern and Southern Egypt, as well as a photo album of selected views of the Bazaars in Luxor and Cairo. It is based on a fascinating journey through an historical land of sand, desert, and lush river bands, busy cities, and quiet villages." Amandine Nabarra-Piomelli: "It is a book that has no beginning and no end. The reader starts reading turn the book read again and turn it again. The covers of the book are treated so the water is smooth and glossy and the background is like sand. The book is based on two main colors: blue for the Nile river and yellow for the sand/desert. The maps are in origami to give the impression of jumping at the reader (the idea is that it is always a discovery to travel but it is also difficult to understand a new culture/country). "This book tries to convey the explosion of information that overwhelms and fascinate travelers like me who visit Egypt for the first time. 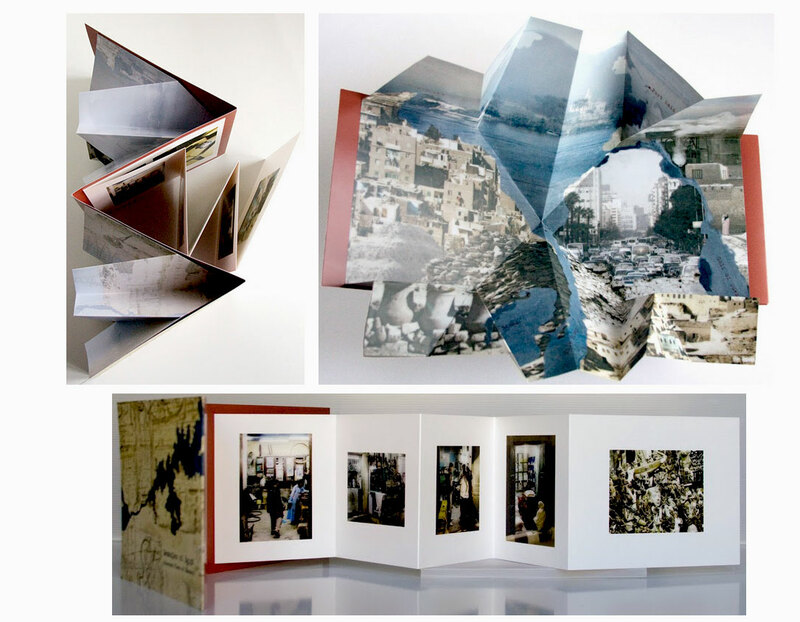 The photo-montages as well as the loop structure of the book demonstrate how difficult it is to connect all the information pertaining to the area: geographically (with the maps of Northern and Southern Egypt, made from aerial maps) and culturally (the series of photographs of bazaars). Since the majority of the territory is desert, the book's covers have been treated to allow the reader to feel the roughness of the sand and the smoothness of the water. Memories of Egypt is a yellow (the desert) and blue (the river) book that will carry the reader on a tactile and visual trip along the Nile." Irvine, California: Amandine Nabarra-Piomelli, 2007. Edition of 45. 5.25 x 7'', 8 unnumbered pages closed; opens to a one sheet book 12.5 x 18.5". Pigmented digital prints on matte paper. 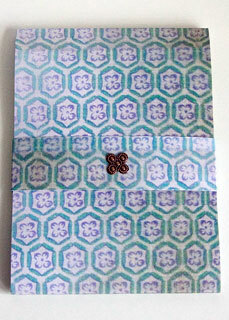 Laid in a matching wrapper with slip/slot closure. Secret Love is constructed as a one page "hidden book" structure folding down to four spreads. Amandine Nabarra-Piomelli: "One of my best friends recently told me she had been loving a man, secretly, since she was in college. Shocked by the news, I went roaming the freezing winter streets of Paris at night, trying to make sense of her conflicting feelings. As I was walking and taking pictures I envisioned painterly images reminiscent of the Impressionist movement and like its painters I wanted to catch particular fleeting impressions of color and light representing my state of mind and my friend's dilemma. I experimented with layering multiple photographs to emphasize sensations of solitude, secrecy, loneliness, and missed opportunities. The 8-page book is nested in a jacket. It unfolds to reveal the "secret" which is written but not readable. ..."
Irvine, California: Amandine Nabarra-Piomelli, 2008. Edition of 40. 2.5 x 7.75 x 1.75"; 87 leaves. Digital pigment prints on Epson Premium Luster paper. Palm leaf structure. 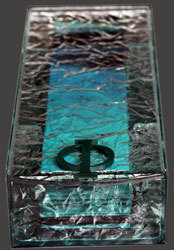 In custom lidded box with magnet closure with book laid in a Phi-shaped recess. 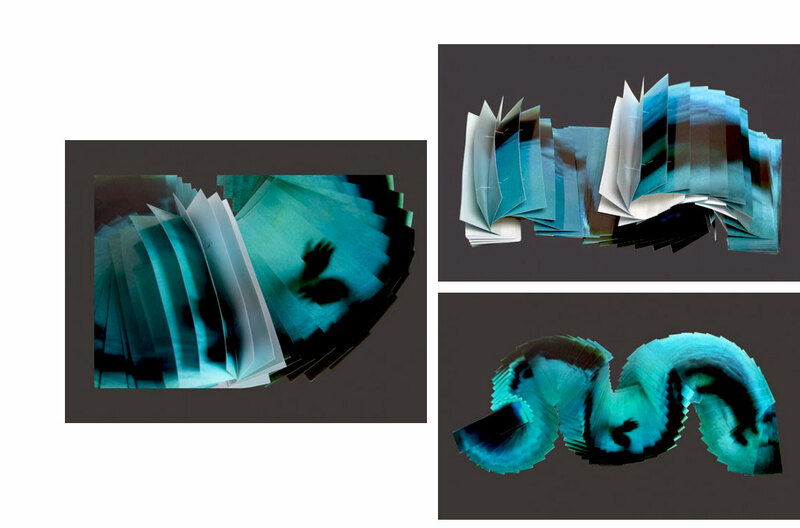 This book visually and tactilely mimics the action of a body in water. The Bernoulli equation for unsteady potential flow (named for Daniel Bernoulli, 18th-century Dutch-Swiss mathematician) is used, among other places, in the theory of ocean surface waves and acoustics. "This is a wonderful book about water. It is a nine photo series of bodies in water that when held in a hand can flow in the other or can behave like waves." Irvine, California: Amandine Nabarra-Piomelli, 2006. Edition of 4. 5 x 6.5" closed; extends to 9". 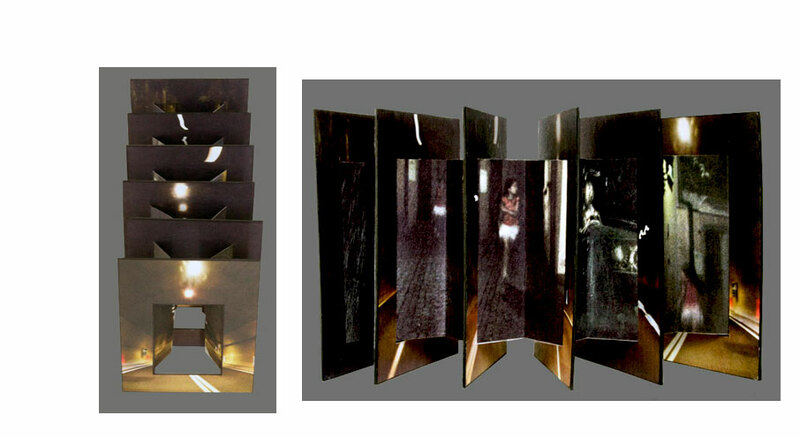 A tunnel book in the form of two parallel accordions supported by 6 frame-like panels. Pigmented digital prints on Japanese mulberry paper. 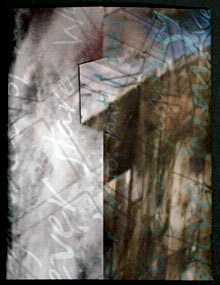 Housed in a black corrugated box with a digital image tipped onto black paper, which is attached to the box's front. 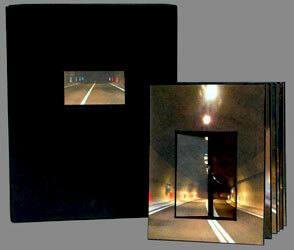 The box contains a black paper wrap attached to the box's bottom and into which the book slips – the tunnel motif even here.